Halgania preissiana is a member of the Boraginceae family in company with the exotic Borage and Comfrey. Sometimes, in older publications, Halgania is included in the Ehretiaceae family. Halgania preissiana is a native of Western Australia and is a dwarf shrub that suckers in our cold climate garden. The leaves are grey-green, oval in shape, wavy with prickly, toothed margins. 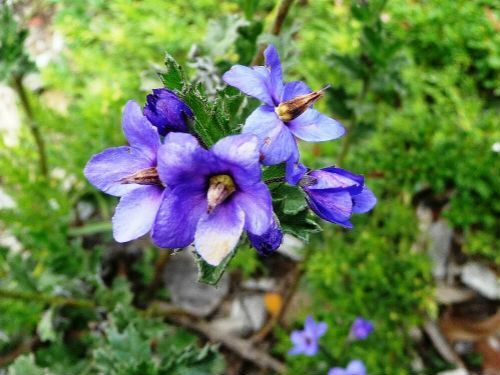 The eye-catching flowers are purple-blue, about two centimetres across. Two or three are carried in terminal or axillary clusters. September to February is the main flowering period with sporadic blooms at other times. Halgania preissiana prefers well-drained sites in full sun or light shade. Our specimens cope with frosts and drought. Remove old branches to keep plant dense and bushy. Halgania preissiana would be an ideal specimen for native cottage gardens and rockeries. There are 18 Halgania species, all endemic. Halgania cyanea is the most widely cultivated species of the genus. Previously Halgania preissiana was considered to be a variety of H. cyanea. The species name honours Johann August Ludwig Preiss (1811-1883) a German-born British botanist and zoologist. Preiss spent fours years (1838-1842) collecting plant and animal specimens in Western Australia. During this period he collected 200,000 plant specimens. Preiss is commemorated in the names of about 100 species of Western Australian plants.